Love Roses? Love handmade natural soap? Want a great gift to make or keep for yourself? 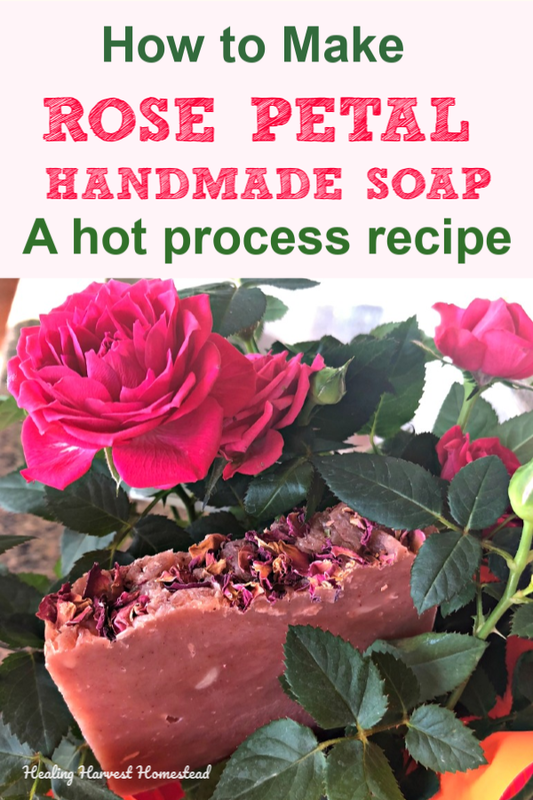 This Rose Petal hot process soap recipe is the perfect choice! It's quick and easy to make too. If you think you missed the soap making cut off of about six weeks (the curing time for cold process soap), you can still get this hot process soap made with plenty of time before Valentine's Day for the perfect gift. It's also great for any time and any person who loves pink, roses, and wants a lovely spa experience in their own shower! If you are new to hot process soap making, you can find out more about making handmade hot process soaps in these complete picture tutorials: Make Your Own Hot Process Soap and Lavender-Rosemary-Vanilla Hot Process Soap. How to Color Soap Naturally with Herbs and Clays---plus LOTS more over on the blog! 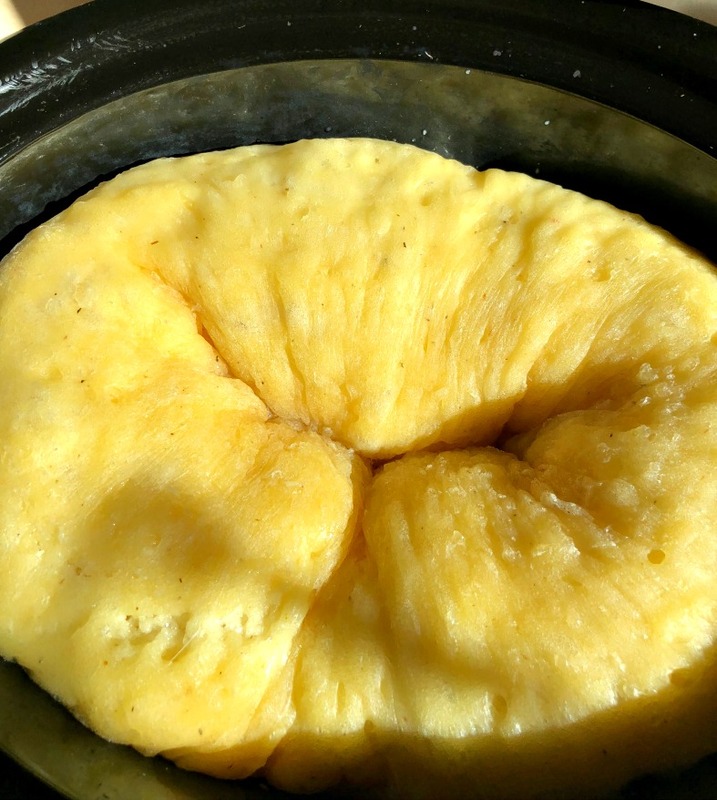 This article is going to give very brief hot process soap making instructions, so please be sure to read the other tutorials mentioned above thoroughly if you've never made hot process soap or used lye before. Or, take a look at my Hot Process Soap Making eBook for a great resource. Click here to get the newsletter & never miss a thing! Plus, you'll get free access to the Resource Library with the Hot Process Soap Making Checklist! If you want to use this recipe for cold process soap, you should be able to convert it easily. It's 5% super-fatted, and should be fine if you don't want to make a hot process soap. A little note about safety: If you're not familiar with working with lye, please read through the articles above. And ALWAYS use your safety gear! A quick mention about this combination: It's really terrific! This soap has excellent slip, even without added clay, lathers well, and has incredible conditioning and moisturizing properties because of the softer oils. I think you'll really like it! Regardless of what I say, always run every recipe you try through a soap calculator first. I like the one from Soap Calc and also Brambleberry has a decent one. 1 1/2 to 2 tablespoons Madder Root powder. I added it at the end of the cook time and stirred it really well, but you could add it to the oil mixture in the crock pot while the oils are melting too. **The Palmarosa essential oil has a scent similar to Rose, but it's very strong and a little "off". I used Frankincense to add a little woody accent to try to get it a little closer to a rose scent. I added the Benzoin because it adds a lovely sweetness to the overall scent, and it's great for your skin! The reason I didn't use Rose essential oil is because that stuff is SUPER expensive! If you come across a bar of Rose essential oil scented soap that doesn't cost hundreds of dollars, then you'll know it's not true essential oil used to scent it. ***Also the links to the essential oils take you to Starwest Botanicals. I get my soap making essential oils there because you can purchase them in a greater quantity, and they are still of good quality. Perfect for making soap. The links for all other items are to Amazon. Learn how to make hot process soap with confidence in my Hot Process Soap Making eBook. It's also available on Amazon Kindle. **You’ll want to download my Hot Process Soap Making Checklist and Basic Instructions so you can print it out. Check off all the steps to be sure you’ve got everything important done! You can get it by completing the form at the end of this article. Step 3) Once the oils are completely melted, carefully pour in the lye solution. Use your hand blender to mix it to trace. Step 4) Now cook the mixture. It will go through several stages. If you're not familiar with how your soap should be looking as it cooks, please refer to the articles mentioned above! Step 5) Once it's cooked to translucency and you're sure it's safe, turn off the heat and allow to cool for a few minutes. Step 6) If you haven't added the Madder Root powder in Step 1, go ahead and do that now. You can add your essential oils too. STIR like a mad-person! You'll want that powder and essential oil blend completely stirred in so there are no lumps or pockets of too much EO. Step 7) Glop your soap into your soap mold. Press it into the mold really well, because you want to be sure there are no air pockets anywhere in it. Step 8) Sprinkle your Rose Petals on top and lightly press them into the soap so they'll stay put. Step 10) Remove from the soap mold and enjoy! You can cut single bars at a time or you can cut bars all at once. It's up to you. NOTE: Hot process soap is safe to use right away, however, letting it sit for a few extra days to a week or so will allow any extra moisture left in the soap to completely evaporate, leaving you with an even harder bar of soap that will last a bit longer. 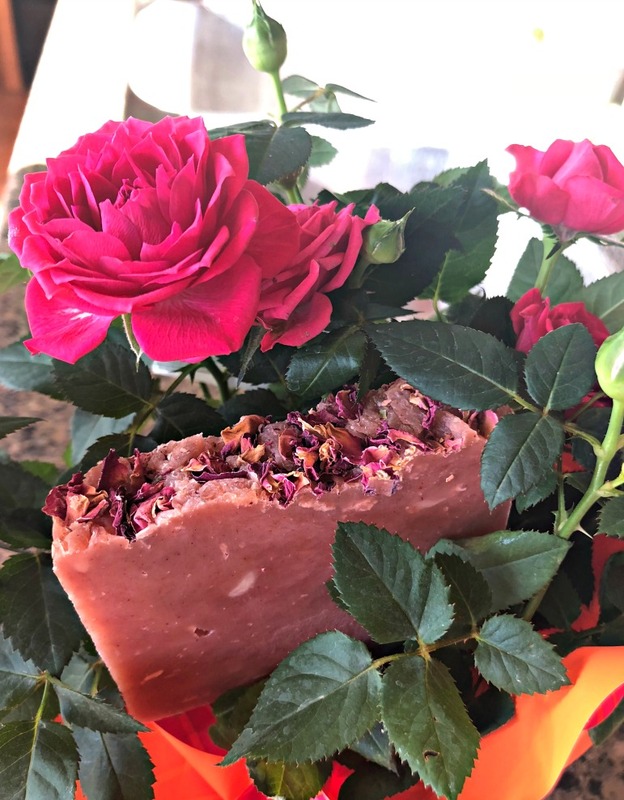 This Rose Petal Soap is pretty, natural, and best of all: handmade! You know what? I'm not really a Rose-scent fan, but I actually really love this soap! It's a lovely neutral pink, and the scent isn't too cloying for me either. The best thing about it (in my opinion) is that it's a really pretty natural soap. And giving a handmade gift is so much more meaningful too. Rosy Chocolate Chai loose leaf herbal tea! Wouldn't that make a great rose-themed gift basket? One thing I am very proud about with all my soaps is that they are truly natural. If you see those brightly colored neon soaps, or the soaps with shine and glitter---NOT natural. And, if you smell an "apple" scented soap---NOT natural. Just letting you know. Many soap makers will add in a bit of fragrance oil or shiny mica and tout their soap as being natural. It's not. Natural soap is made using clays, salts, herbs, and essential oils. Maybe some pumice and activated charcoal too. But all that other stuff? Nope. Beware, I say! And if you make it yourself, then you know what exactly is in YOUR own soap. That's a wonderful feeling! At any rate, I think this soap came out perfectly as a gift for Valentine's Day or just any time! What do you think? Do you have other ideas for this soap? I'd love to know what you think! Leave questions or comments in the comments section! Wondered how to make hot process soap? 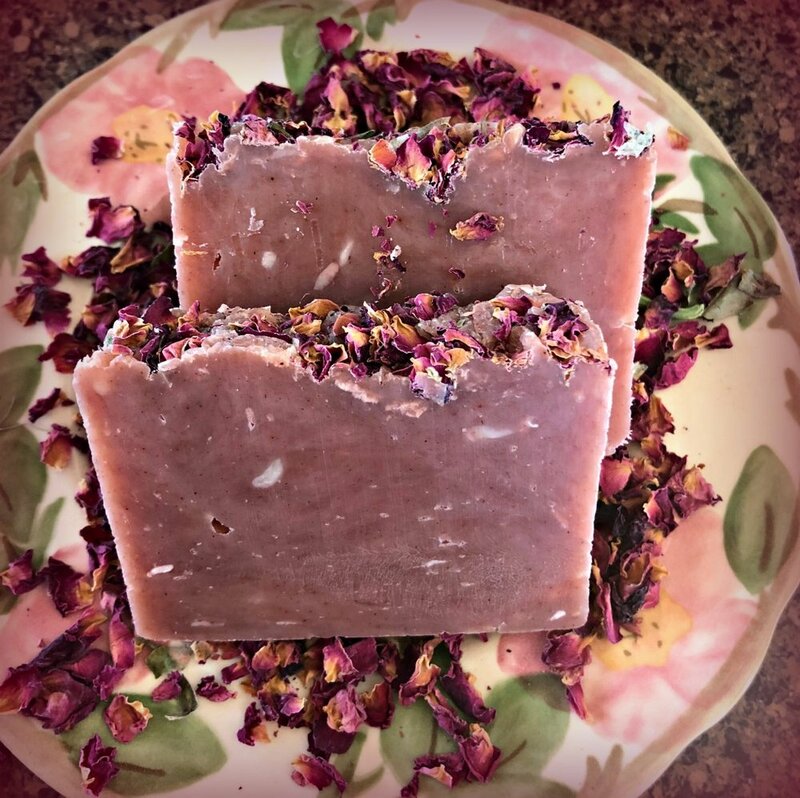 Here's my recipe for Rose Petal Hot Process Soap you'll love! LOVE! This article has been shared on the Homestead Blog Hop!